How do I edit a photo or an image/screenshot? How do I save an image to my SD memory card? How to change the target folder for saving pictures and screenshots? How to I save an image to Nimbus? How to change image quality (for example, make it smaller to decrease file size)? 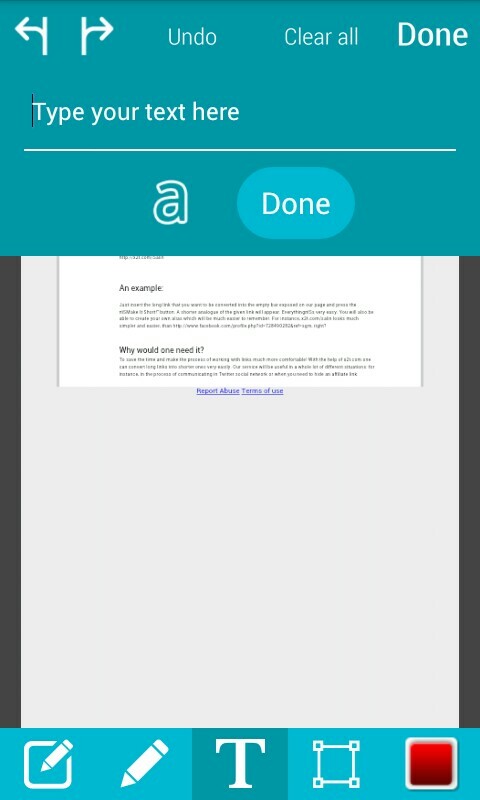 How to save articles to Nimbus Note and Pocket at once? How do I clip an article without default styles? How to make sure the browser loads a blank page upon launching rather than the page that was open in it last? After launching the app, you will see the Nimbus login page. If you already have a Nimbus account, use your username and password to sign in. If you don’t have an account, you can register a new one. You also can choose to work without signing in, but doing so won’t allow you to clip web pages or save screenshots to Nimbus Note. Next you will see the starting page of the app. If you want to edit (or share) a photo, tap on Take Photo. If you want to edit an image you have on your computer, tap on From Gallery. 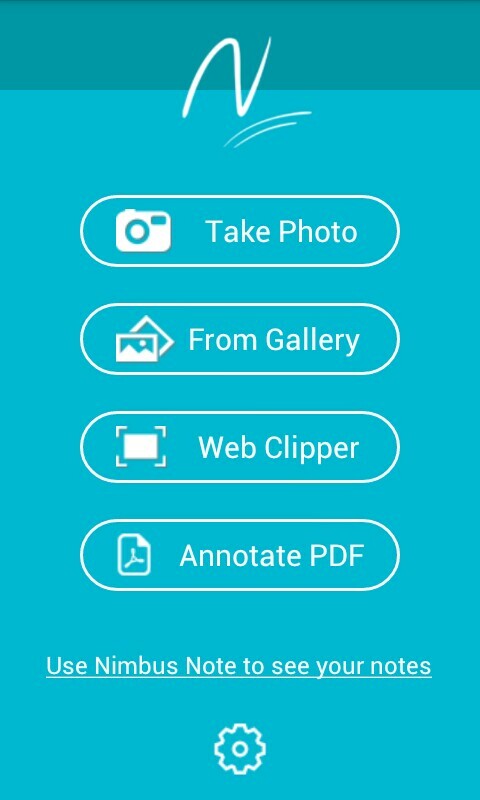 If you want to clip a web page or an article from a page as well as take a screenshot of it, tap on Web Clipper. 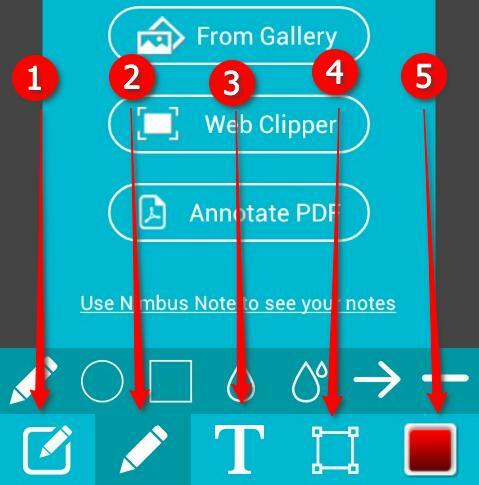 How to scan a document with Nimbus Clipper? How do I take a screenshot of a website ? Open the website that you want to capture and choose Take Screenshot from the menu. Please, note that this feature allows you to capture only the visible area on your screen. How do I edit a photo or an image/screenshot ? After taking a screenshot or a photo, you will be redirected to image editor mode. 1) Edit – tap this button to choose between tools. Tap on the tools to draw shapes on the image or change their color scheme. The pensil tool allows you to draw custom shapes on the image. The line tool allows you to draw straight lines. Circle and Oval tools allow you to draw circular shapes. The arrow tool is for drawing arrows pointing at different elements on the image. The blur tool allows you to hide certain parts of the image while Blur All is for blurring out the whole of the picture except for the part you specify. 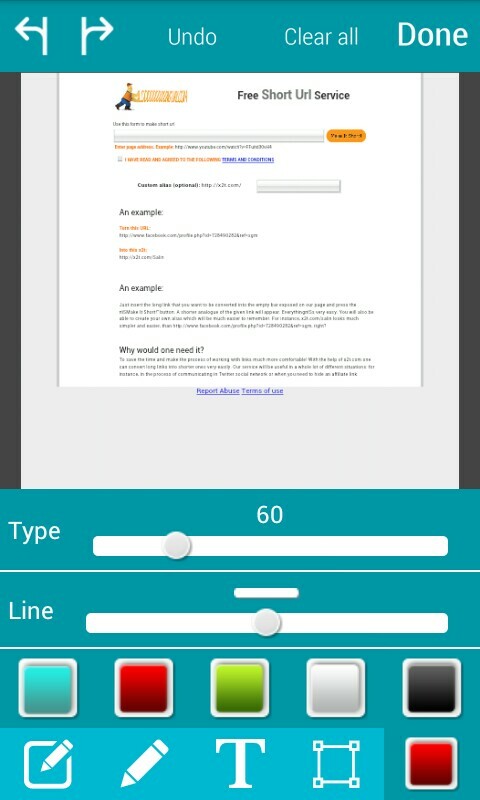 3) Text tool – tap on any part of the image and add text to it. 4) Crop tool allows you to crop the image, leaving only the segment of it that you want saved. 5) Color and Size tool – use it to change the color of shapes drawn with other tools as well as specify the thickness of the lines and the size of the text. If you need to zoom in or out on the image in the image editor mode, just use the volume control buttons on your mobile device. The volume up button zooms the image in and the volume down button zooms it out. How do I save an image to my SD memory card ? Open settings and select a required folder in Default folder for images. Tap on the button. If you haven’t signed in yet, you will be prompted to do so at this point. 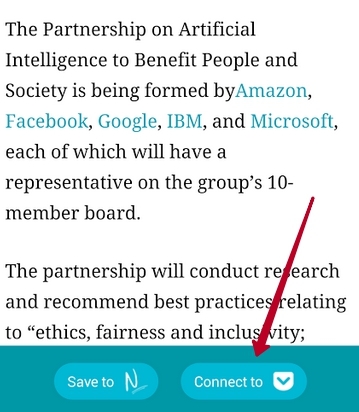 Open the site in the browser (or do a URL Share from your default browser) and press on the button. 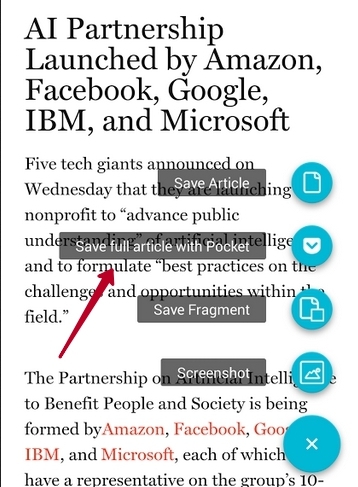 Save Article – clip the text in easy-to-read mode (without ads and unnecessary hyperlinks). You also can clip practically any fragment of text on the web page. Just tap on Save Fragment, choose the fragment you want with the + button and press Done. As soon as you specify the fragment you want to clip, you can view it in the preview window. it to Nimbus and get a direct URL to view the text. 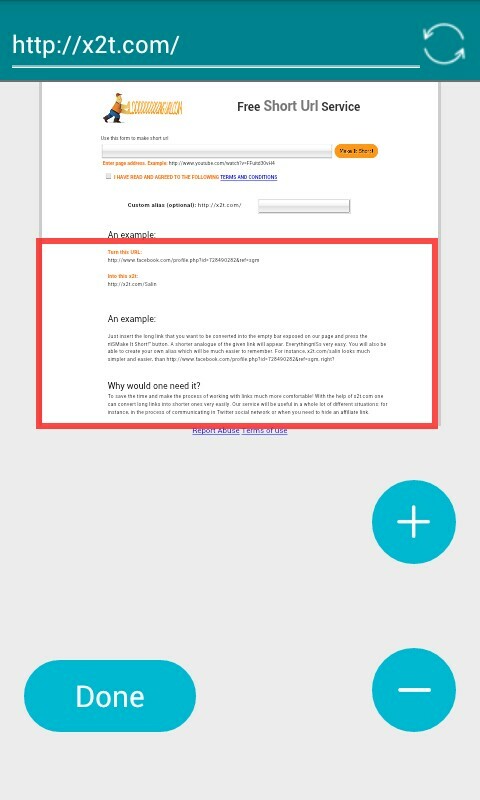 Go to the website and select option Safe full article with Pocket. In the window that appears press on Connect Pocket and log in Pocket. 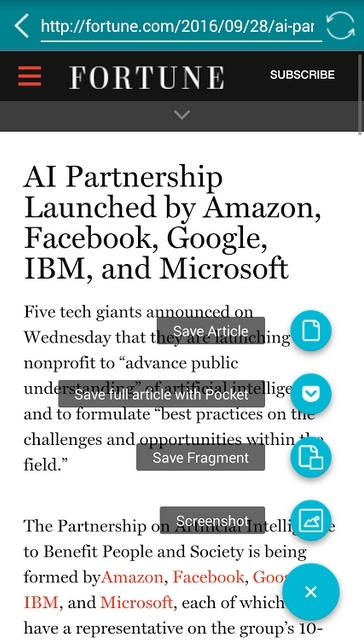 Then just press on Save full article with Pocket for articles to be automatically saved to Pocket. To save to Nimbus Note press on the Save to Nimbus Note button. Go to settings and choose Without Style Saving under Clip Style. You can change your browser behavior in Settings - On startup.